Fisher Hill will now be doing the job of shipping its books. We will no longer be using a distributor. By doing it ourselves, we hope to provide better and faster service. Anytime you have questions about our books or website, you can call us at 1-888-407-1187 or email us at therst@icloud.com. 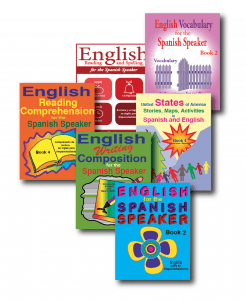 Fisher Hill has several series to help Spanish-speaking teens and adults learn English. Fisher Hill has a series called English for the Spanish Speaker. This series contains four workbooks and four CDs. Each book in the series has eight lessons. In Books 1 and 2, the lessons are about every day activities. In Books 3 and 4, four lessons are about every day activities and the other four are about United States history or government. Each lesson begins with a vocabulary list, then a conversation, story, activity pages, and finally an answer key. The lessons are bilingual with the word lists, conversations, and stories presented in Spanish and English. The directions for the activity pages are in Spanish but the activities are in English. There are two dictionaries at the back of each workbook: a Spanish dictionary and an English dictionary. There is a CD available for each workbook so the student can listen to the vocabulary lists, conversations and stories in English and Spanish. Fisher Hill has an excellent English literacy program for Spanish-speaking teens and adults who want to learn how to read and write in English. There are six levels in the program. Each level has four workbooks: Reading and Spelling, Reading Comprehension, Writing Compostition and a Vocabulary workbook. With each level, the student needs to start with the Reading and Spelling workbook. On our web page under Teacher Resources, there are placement tests to find out on which level a student should begin. To find these placement tests, click on Teacher Resources on the home page from the top tool bar. Then on the next window, click on Reading and Spelling. Finally, scroll down until you come to the Student Spelling Placement Tests. A student needs to score 80% or more on the test in order to go to the next level. Anytime you have problems navigating through our website, you can give us a call and we can help. Spanish Made Fun and Easy is another popular series from Fisher Hill to help people learn to speak and write Spanish. By distributing our books, ourselves, Fisher Hill will be able to provide better and faster service to our customers. Visit us online at www.Fisher-Hill.com to see all of our workbooks.